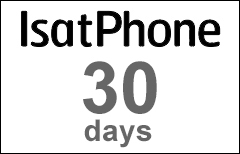 The IsatPhone 30-day extension voucher extends the validity of your active Inmarsat IsatPhone prepaid account with a balance of greater than zero. Multiple 30-day vouchers can be combined to extend the validity of your IsatPhone account by the cumulative period of time. The 30-day voucher can only be applied to prepaid accounts that have unused prepaid balance. Otherwise a voucher with units must be reloaded first. If your IsatPhone account balance is fully depleted and drops to 0 units, any time validity will be immediately reset to 0 as well.